The popular motion comics are finally coming to HD discs, and at a nice price to boot. 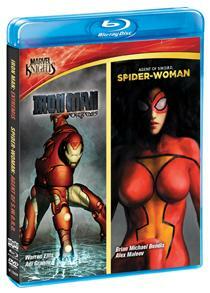 Hulu and Netflix users may have already taken a look at what Marvel's motion comic line has to offer, but soon both the Spider-Woman and Iron Man comics will be available on Blu-ray, in beautiful 1080p and exclusively from Best Buy. The 'Marvel Knights Spider-Woman: Agent of S.W.O.R.D. / Iron Man: Extremis' Blu-ray include, along with the motion comics themselves, a few nice supplements including an interview with Iron Man artist Adi Granov and a few behind the scenes looks at the production of the comics. If you pick up the Blu-ray on June 17th or 18th, you'll be able to take advantage of a coupon that will get you the set for just $19.99. Snag it directly from Shout! Factory.